Energy subsidization is an area of intense debate simply because it artificially promotes some technologies over others. In practice, a high degree of subsidization implies that the energy sector (the very foundation of our modern civilization) is shaped by politicians rather than by scientists and engineers. And yes, it does not really take a rocket scientist to figure out that this can only end one way – badly. To further complicate matters, debate is intensifying about the so-called external costs (externalities) of various energy technologies. The most common mention of externalities in the energy debate is related to the negative effects resulting from fossil fuel combustion, and the failure to internalize these externalities in the selling price can be viewed as an indirect subsidy. This article will take a closer look both at direct and indirect forms of subsidization. The IEA estimated fossil fuel subsidies at $523 billion and renewable energy subsidies at $88 billion in 2011. Given that fossil fuels provide 87% of global energy and subsidized renewables contributed 1.7% in that year (BP statistical review), direct subsidies to renewables were 8.6 times greater per unit energy than direct subsidies to fossil fuels. However, there is an important difference between the subsidization of renewables and fossil fuels: renewable energy subsidies allow energy to be sold below the cost of production, while this is rarely the case for fossil fuels. As shown below, fossil fuel subsidies are primarily related to oil and shows a high degree of proportionality to the oil price. This is because the bulk of these subsidies are in oil-producing countries which can still extract oil from their conventional oil fields at very low prices and continue to pass these low prices on to local consumers. 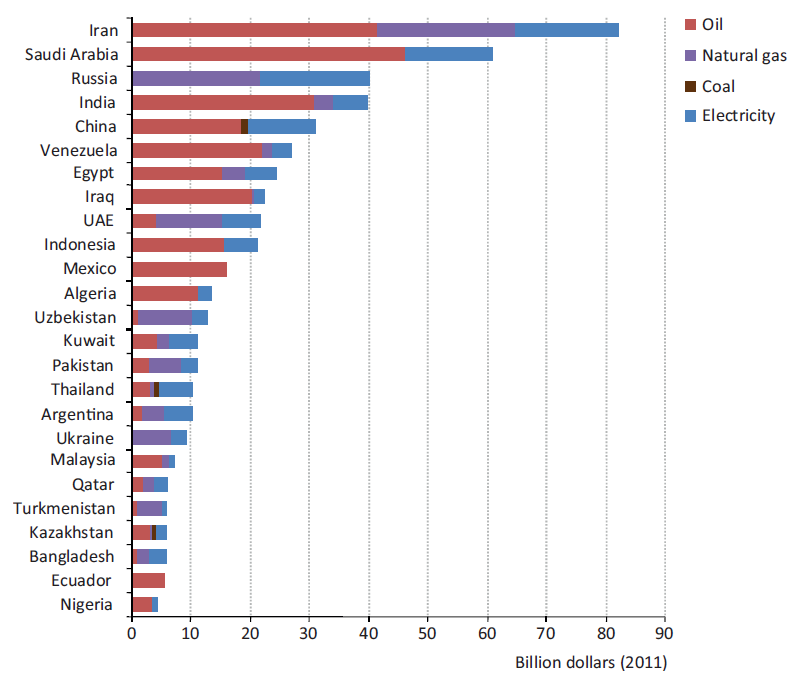 The breakdown of fossil fuel subsidization per country is given below. It is clear that the list is dominated by fossil fuel producing developing nations. These nations simply prefer the economic growth provided by selling fossil fuels closer to the local cost of extraction over the increased profits resulting from selling more of their product at international market prices. Yes, to developed world citizens, this might appear to be a wasteful and selfish practice, but we have no right to prevent these developing nations from enjoying the full economic advantages of their fossil fuel resources. People born in the developed world enjoy one order of magnitude greater material affluence than people born in the developing world because of one century of $20/barrel oil and $20/ton coal. It will not be politically possible to tell the developing world that they do not deserve to derive similar advantages from the fuels they can still extract at or below these prices. Forcing Kuwait (which can still extract oil for as little as $3/barrel) to sell this oil locally at $100/barrel would be similar to forcing a solar farm in Mexico to sell electricity at the same price as that required by a solar farm in Greenland. The only reason why the lower oil prices in Kuwait are labelled as a subsidy is because the highly concentrated liquid nature of oil makes it highly suited for international trade. If oil was less suited for international trade (like solar power), the subsidies reported in the above figure would be much smaller. In fact, if energy subsidization was defined as the total amount of direct government support given to close the gap between high production costs and lower selling prices (such as is the case for renewables), fossil fuel subsidies would amount to an enormous negative number due to the large revenues governments in fossil energy producing countries derive from profits on fossil fuel exports. 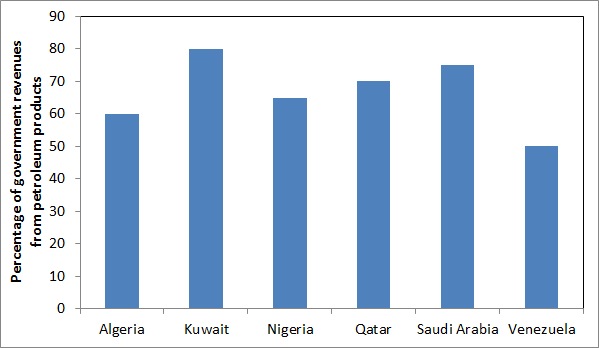 The figure below illustrates this for a number of OPEC member states based on data on the official OPEC homepage. It is therefore clear that the direct subsidization of fossil fuels (in the sense that the product is sold closer to local extraction costs) is not going away any time soon. No developed world citizen living in a world of material affluence built almost entirely through cheap fossil energy has the right to complain about this form of subsidization. When talking about externalities, it is important to distinguish between long-term global and short-term local externalities. As this section will strive to explain, short-term local externalities of fossil fuels such as poor air quality (negative) and rapid economic development (positive) should arguably be of much less concern to policymakers than long-term global externalities such as climate change. The good thing about short-term local externalities is that citizens experience the negative and positive externalities in a fairly equitable manner, thereby enabling them to weigh these positives and negatives with reasonable accuracy. For example, if the negative effects of air pollution from coal-fired power plants begin to outweigh the positive effects of cheap and reliable electricity, citizens will start to resist further coal-fired plants or demand that existing plants be upgraded with pollution control mechanisms. Naturally, this implies a trade of more expensive energy for cleaner air, but, since both the electricity price and the air pollution are short-term local effects, this will be a reasonably well-informed trade. Citizens in the rich world have been making this trade-off for quite some time now. The sharp drop in US air pollution caused by increasingly strict legislation on coal-fired power plant emissions (below) offers a good example. As is evident from the above figure, improved technology can greatly reduce the air pollution effects of coal-fired power plants. This technology is also not very expensive, but will only be implemented when the population becomes sufficiently affluent that effects such as cleaner air are valued above very cheap and reliable power. For example, one study found that the non-CO2 externalities of coal-fired electricity can be reduced from 10.3-28.4 €cent/kWh to 1.6-3.0 €cent/kWh through levelized plant capital costs amounting to only about 0.7 €cent/kWh. A further 1.4 €cent/kWh in levelized capital costs can reduce the externality to only 0.5-0.8 €cent/kWh through a 99% reduction in SOx emissions and a 75% reduction in NOx emissions. The air pollution externality also depends greatly on the country of interest. For example, the oft-quoted study of Epstein et al. determined the air pollution externality of coal in the USA to be 9.3 $cent/kWh – more than triple the CO2 externality at $30/ton. This value comes from assigning a price tag of $187 billion to 24475 excess deaths in 2005. If this valuation was used for the 444000 Americans killed by smoking every year, it can be calculated that cigarettes cost the US almost a quarter of its entire GDP. This very high externality is therefore more indicative of the enormous healthcare expenses created by the typical western pattern of destroying the body through unhealthy consumption habits and sedentary living before being bankrupted by the degenerative diseases that inevitably arise from such poor lifestyle choices. 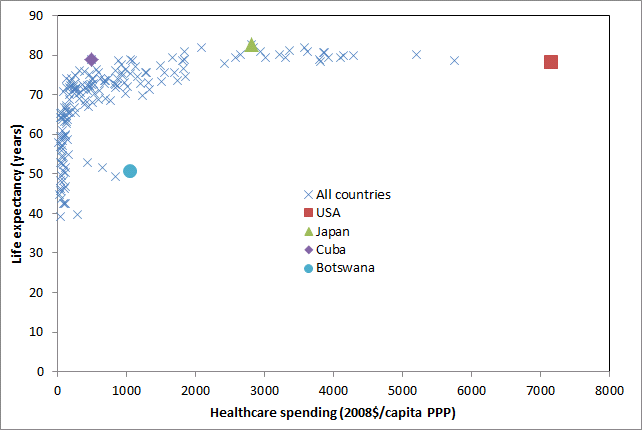 The figure below compiled from Wikipedia data on healthcare expenditures and life expectancy proves this point. In developing nations such as China and India where air pollution in the big cities often reaches truly shocking levels, the air pollution externality is generally calculated as being much lower. 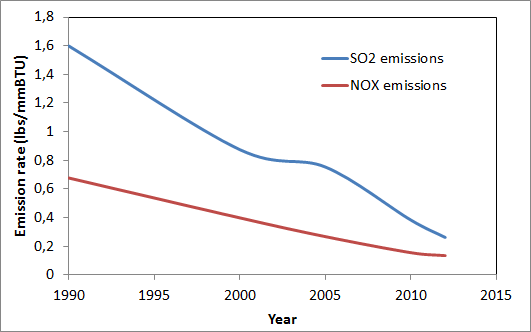 One study for China found that the externalities related to SO2, NOx and particulates are substantially smaller than the externality of CO2 at $50/ton. Another study came to a similar conclusion for a large Indian city. In comparison to the 15 $cent/kWh non-CO2 externality calculated for the US in the Epstein study, the Indian study calculated only 1 $cent/kWh for all non-CO2 externalities (coal mining, coal transport, human health and agriculture). It is therefore clear that negative short-term local externalities in the two countries accounting for 76% of the 1400 GW of coal-fired power plants currently being planned globally and 58% of current global coal consumption are still perceived to be substantially smaller than the positive short-term local externality of rapid economic development. If you have lived in a developing nation and directly observed the horrible vicious cycles of poverty in action, this will be very easy to understand. Those who have lived their entire lives in fossil fuelled western luxury should try to live on $2/day for a few weeks to gain some perspective. 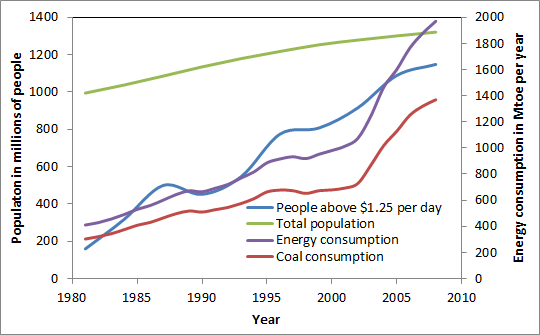 According to the World Bank, the coal-driven Chinese economic miracle has reduced the number of people living below $1.25/day from 84% in 1981 to only 13.1% in 2008 (energy data in the graph above is from the BP Statistical Review). As of 2008, there remains 1.3 billion people living below $1.25/day and 2.5 billion living below $2/day. The vast majority of these people would gladly trade high levels of air pollution for economic development. It is therefore clear that including non-CO2 externalities to the tune of $0.15/kWh into the price of coal-fired electricity in the biggest coal consuming nations is a matter of complete impossibility. As nations develop, the population will naturally demand a shift to cleaner energy sources as the negative short-term local externalities begin to outweigh the positives. Thus, while headlines such as those created by the Epstein study will continue to fuel intense debate for many years to come, it is highly unlikely to lead to any meaningful practical implementation. To make the debate more balanced, it would be useful to not only monetize the external costs of fossil energy, but also the economic impacts of the recommended price increases and the external costs of the recommended alternative energy sources. For example, the financial crisis caused in part by a quadrupling of oil prices cost the US substantially more than the $345 billion (2.2% of GDP) calculated by Epstein et al. (the bust cut $16 trillion from household wealth, only 45% of which has been recovered to date). Also, one gets twice the number of Google hits for “protest wind power” than for “protest coal power” even though wind supplies only about 3% of the energy supplied by coal on a global basis. Such a more complete and objective approach is sorely needed at this stage of the debate. This category of externalities (predominantly climate change) is completely different. In this case, there is a very poor connection between the negative externality of climate change and the positive externality of rapid economic development – a discrepancy which definitely should be corrected. For example, the 17% of people living in developed nations are currently enjoying the material affluence granted by 76% of cumulative CO2 emissions up to 2002, while the negative effects of these emissions will have a disproportionate effect on the lives of developing world citizens. While this global nature of climate change is a serious concern, the primary problem with the climate change externality is its long-term nature. 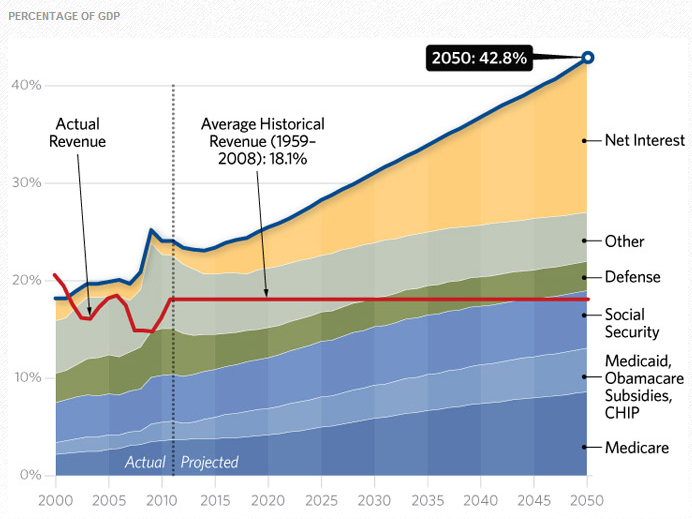 This means that the world as a whole can easily pass the buck to future generations, something which we are very good at as illustrated by the US budget projection below. Developed world citizens should be careful not to distort the facts about energy subsidization through subjective bias or ignorance in an effort to vilify the very energy source that made their fortunate positions in life possible. Energy subsidization is a very important and sensitive subject and the proliferation of ideologically attractive, but unbalanced opinions can end up doing much more harm than good by perpetuating political stalemate and increasing market uncertainty. Relatively speaking, the direct subsidization of fossil fuels is very small and is arguably the right of the energy-exporting developing nations where these subsidies are predominantly implemented. On the topic of indirect subsidization, it is recommended that studies of the short-term local externalities of fossil fuels monetize not only the negatives, but also the positive effects in terms of rapid economic development and the negatives of alternative energy sources at high penetration levels. This approach will much better reflect the continued real-world dominance of fossil fuels in the global economy. Arguably the only fully legitimate case for unjustified fossil fuel subsidization is in the form of the long-term global externality of climate change. Citizens reaping the benefits of cheap and reliable fossil energy are separated by many years and thousands of miles from those that must face the consequences. This is a clear market failure and must be corrected through a scientifically derived price on CO2. All other commentary around direct subsidization and short-term local externalities of fossil fuels can be seen as a very unfortunate distraction pulling focus from this matter of central importance.